Advanced’s fire panels have been specified to protect London’s landmark Leadenhall Building, which is affectionately known as the Cheesegrater. Standing at 224 metres tall, the Cheesegrater comprises 45 floors of office space. It is based in London’s financial district, in close proximity to the iconic Lloyd’s Building and St Paul’s Cathedral. A network of 18 MxPro 5 eight-loop panels has been specified to protect the building. The new fire safety system incorporates a number of Advanced’s AdSpecial custom built panels and interfaces, including a smoke control panel, an microphone enclosure and sprinkler and wet riser status panels. 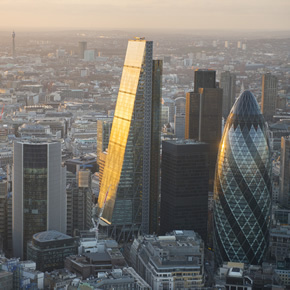 The panels were specified to work alongside Advanced’s LifeLine panels in the Leadenhall Building; together, the systems work to provide a total DDA solution with no fees or annual contracts. MxPro is Advanced’s flagship multiprotocol fire system. It includes two panel ranges: the MxPro 4 and the MxPro 5, which is backwards compatible with the aforementioned. Boasting EN54-2, 4 & 13 approval, the MxPro 5 panels also feature AlarmCalm false alarm management. TouchControl touch screen repeater technology is also supported; the 10” HD touchscreen offers reporting and control, via an interface that includes Active Maps and zone plans. The panels can be used in single loop, single panel format, or configured into 200 panel networks to cover larger areas. In addition, the MxPro range offers four protocols – Argus, Apollo, Nittan and Hochiki – and an open installer network, which benefits from technical support and training. Meanwhile, Advanced’s LifeLine panels have been designed to provide a hearing impaired alert system and both ESPA-compatible fire engineer paging and staff paging. Lifeline features a variable 2W UHF transmitter to ensure total coverage and minimal power usage.